Frisbee golf - I enjoy playing it when I have time. Fortunately, the tri-state area has several courses available. In 2013, I participated in the Vibram tournament - but no medals! It was fun. Windsurfing - If you've never tried this sport, I highly recommend it. I actually haven't had an opportunity (or the time) to do that in several years. 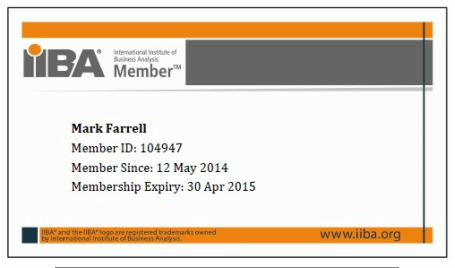 Somewhere, I still have my Windsurfer Sailing School license, and plan to use it again, however. Boating - Whenever I have a few hours in the summer, I enjoy taking a canoe or kayak out, and paddling through the river. I also enjoy renting a pontoon boat and going fishing. Programming - I love to learn new concepts, and ways to implement them. I particularly like it when I can save people (and myself) time. I do a lot of stuff in VBA that others don't realize can be done with such, using API calls and all the reference libraries available, in a portion of the time that it takes others. I have recently started developing Android apps, and hope to market one soon. Snow Skiing - I enjoy snow skiing, particularly at 7 Springs in PA.
Motorcycling - I have a Harley and enjoy riding my motorcycle on warm summer days. Travel - It's always fun to visit new places. 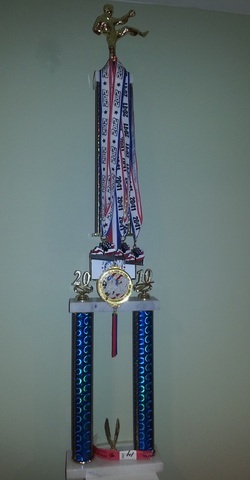 I've been to Canada, Mexico, Russia (Moscow, St. Petersburg, and Novosibirsk - took 2.5 years of Russian in college, enabling me to have a fluent conversation with any Russian 2-year-old), Italy, Bahamas, Greece (Athens, Santorini, and some other small islands around the area), and to many of the states, including Hawaii (Maui). 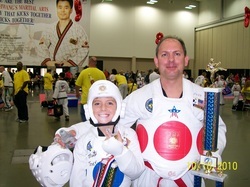 My son and I both participated in the U.S. Open Taekwondo tournament in Louisville, KY; we both won trophies and medals. 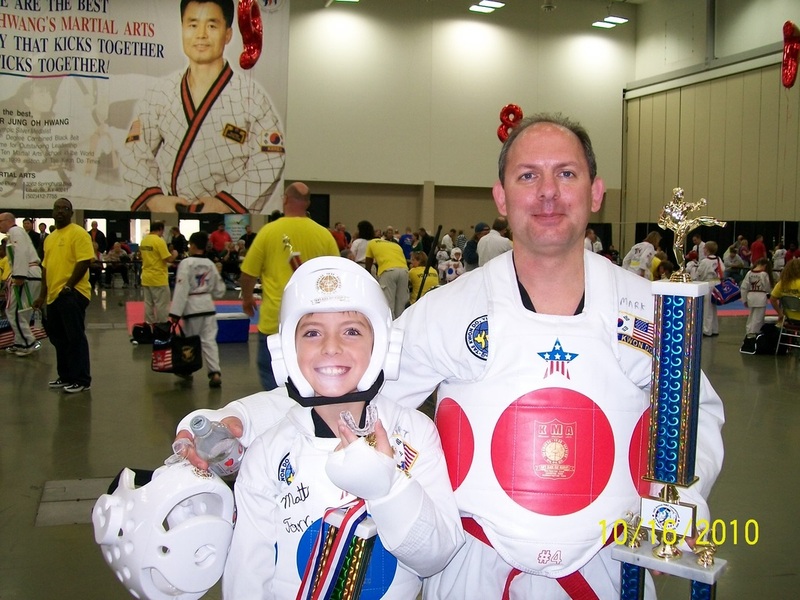 This picture was taken after the tournament. 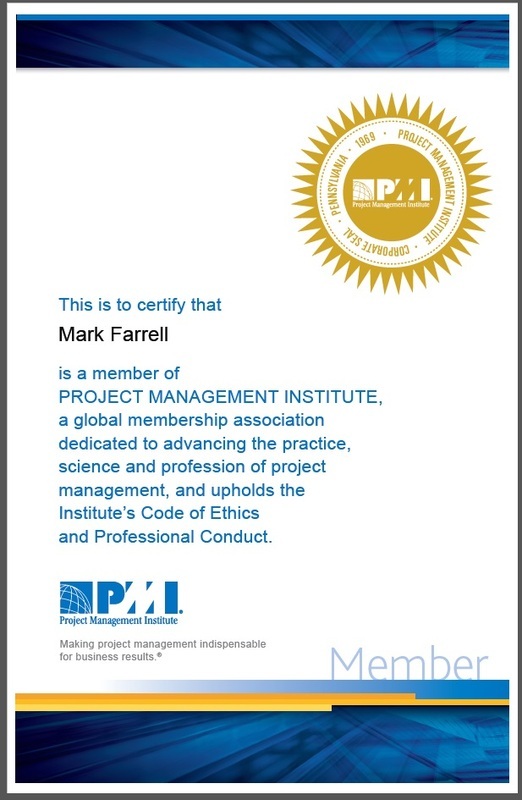 I'm a member of the southern Ohio branch of the Project Management Institute, an organization that is dedicated to properly handling various projects. 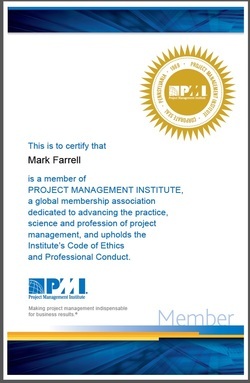 Additionally, I'm a certified PMP (Project Management Professional), associated with the organization; see the Certifications link for more.